Why I read this: I thought it sounded like a nice change of pace from what I've been reading. Plus I really like the cover. Summary (from Goodreads): Life on the tiny island of Guernsey has just become a whole lot harder for fifteen-year-old Cat Rozier. She’s gone from model pupil to murderer, but she swears it’s not her fault. Apparently it’s all the fault of history. A new arrival at Cat’s high school in 1984, the beautiful and instantly popular Nicolette inexplicably takes Cat under her wing. The two become inseparable—going to parties together, checking out boys, and drinking whatever liquor they can shoplift. But a perceived betrayal sends them spinning apart, and Nic responds with cruel, over-the-top retribution. Cat’s recently deceased father, Emile, dedicated his adult life to uncovering the truth about the Nazi occupation of Guernsey—from Churchill’s abandonment of the island to the stories of those who resisted—in hopes of repairing the reputation of his older brother, Charlie. Through Emile’s letters and Charlie’s words—recorded on tapes before his own death— a “confession” takes shape, revealing the secrets deeply woven into the fabric of the island . . . and into the Rozier family story. My thoughts: The Book of Lies revolves around the Rozier family, past and present. The book begins with a confession from fifteen year old Cat that she has killed her "friend" Nicolette. The rest of the book explains the complicated relationship and events that led up to the accidental murder. We also learn about Cat's uncle, as told by her father on old tapes. He was held as a prisoner by the Nazi's during their occupation in Guernsey in WWII. Historical fiction based in WWII has always fascinated me but that part of the story actually fell flat for me in this case. I was more interested in Cat's slow reveal of how she became an accidental murderer. Cat was kind of an annoying teenager but I found it very easy to read the sections she narrated. It was like she was telling her story directly to me. I also was never quite sure if the murder was actually an accident because of how often she seemed like she was okay with it. I don't really blame her since Nicolette was so awful to her but there were times where I thought Cat could have done with some medication to combat the crazy vibes wafting off her. This was a difficult review to write, partly because I've just been in a blogging slump and partly because I felt like there wasn't too much that actually happened other than Cat's story behind her confession and that murder might run in the family. 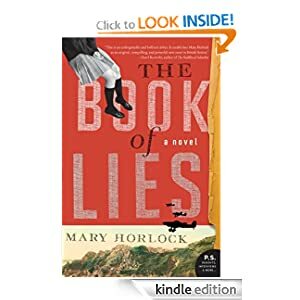 The Book of Lies was an interesting read with enough mystery to keep my attention but I wasn't wowed by the suspense level. I read this one a couple of months ago and thought it was kind of mehhh.